The only living coral reef in the United States is located in the Florida Keys and is the third largest barrier reef in the world. 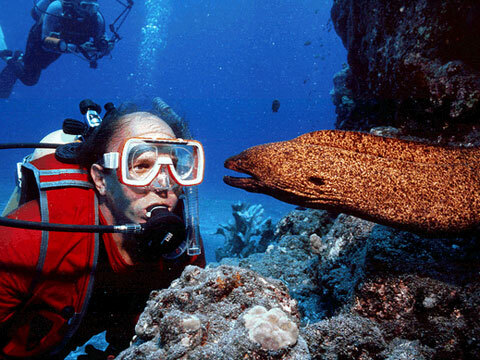 Part of this wonderful treasue is located Key Largo which is known as the Scuba Diving Capital of the World. The Florida State Park, John Pennekamp Coral Reef State Park, along with the Key Largo National Marine Sanctuary in 1975, proclaimed Key Largo to be protected from spearfishing plus coral collection for not less than 40 years. Key Largo is a key component in the 2,800 square nautical mile Florida Keys Marine Sanctuary. Statue of Christ of the Abyss is the third bronze sculpture from the original mold was presented to the Underwater Society of America in New York in 1962. On August 25 1965 it was placed approximately 25 feet off the waters of Key Largo, Florida. It is located around Dry Rocks, around six miles North east of Key Largo in the John Pennekamp Coral Reef State Park. While the statue weighs around 400 pounds, the concrete base to which it is attached weights about 20,000 pounds. Key Largo and the Florida Keys are an absolute dream for any diverr. Whether your just beginning or a seasoned pro, the waters surrounding these beautiful islands are sure to give you a day of diving you will never forget. There is fantastic diving to be had in Key Largo. The Florida Keys have some of the worlds most experienced dive captains that would love to take you out and show what true saltwater diving is all about. Diving in the Keys will have you viewing tarpon, bonefish, permit, marlin, dolphin, redfish and many more exotic and beautiful species. Be sure to check our the listings on ConchTV.com for an excellant section of water sports activities. The traveler planning a visit to Key Largo can easily choose a jet ski, a kayak or just about any type of boat rental. Also, there are countless dive shops that are more than willing to provide everthing a diver and snorkeler could need. From Key Largo diving informatiion to snorkel gear.